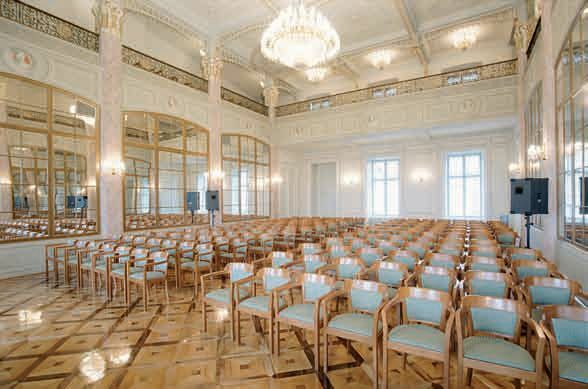 There are not that many houses in Zagreb that can testify to big events as can the Illyrian Hall. It has a most beautiful interior made in the classicist style, and it is also one of the most important buildings in the modernday cultural and political history of Croatia. The building was built in 1838 and in 1844 the Illyrians who fought for an independent Croatia, bought it. They would hold society meetings, fancy balls and various conferences here. In the 1940’s all major cultural, educational and science institutions utilized the building and important political and national meetings were held there. The importance of the Illyrian Hall in the life of the city and the way it intrigued the chronicle writers of previous eras can be testified to by the fact that a picture of the palace became a popular motif for playing cards. If you want to ensure that a meeting, reception or promotion with business partners is talked about as a memorable one, then this is the right choice for those who look for an atmosphere of exceptional ambience equalled by its dedicated service. INSIDE VENUE: If you want to ensure that a meeting, reception or promotion with business partners is talked about as a memorable one, then this is the right choice for those who look for an atmosphere of exceptional ambience equalled by its dedicated service.